Vitiligo occurs in almost 1% of the population. It is characterized by ivory white patches of skin. Vitiligo may begin in childhood or adulthood and may occur on any skin surface (including the lips, eyelid, and genitalia). About 30% of vitiligo patients have a relative with this condition. Vitiligo is thought to be an autoimmune condition. It may be associated with autoimmune thyroid disease, diabetes and alopecia areata. For localized cases, topical creams (either topical steroids, vitamin D, or calcinuerin inhibitors) are effective. In more widespread cases, light therapy (narrowband UVB) may be effective in leading to repigmentation. For resistant localized cases, excellent results are seen with the eximer laser. Vitiligo is particularly devastating for patients with ethnic skin. 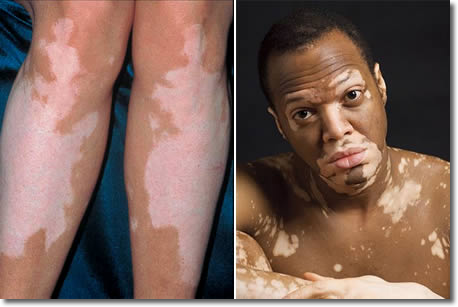 As ethnic skin tends to have more pigment, the ivory white patches of vitiligo are very readily visible in comparison. Of note, some Indian religions regard vitiligo as a result of living a previously “bad” life. Aggressive and early treatment of vitiligo is advocated in ethnic skin to prevent spread and improve quality of life.